First off. I can’t take credit for this idea, Maggie Mason of Mighty Girl often does this with her son Hank. I just made it a little more grown up. 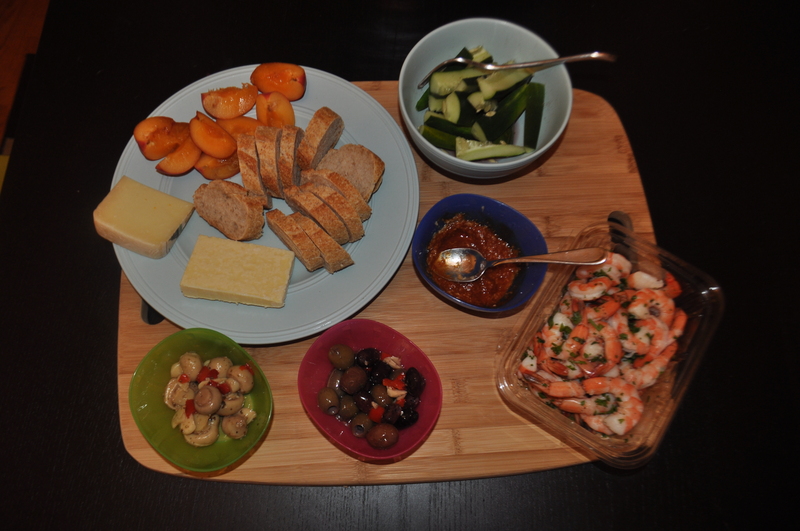 Now for those who don’t know snack dinner is where you combine a number of small food stuffs together to make a full and delicious meal, it’s pretty much tapas but super easy in that you don’t have to cook much or really do anything other then lay it all out and devour. The idea struck me on Tuesday night as I was wandering the produce section of Whole Foods trying to decide what to make for dinner. All I really wanted was to eat the whole brick of aged English cheddar that was in my fridge, however I realized that it wasn’t a complete meal. And the hubs was going to want more food then that. So I started adding things to my cart till I had a more or less complete meal. From the seafood section I grabbed a container of pre-cooked shrimp which I served with homemade cocktail sauce (1/4 cup of curry ketchup plus horseradish to taste, I pretty much do a 1:1 ration but we like spicy). Then I took a few cucumber and julienned them and tossed them with 1/8 cup of red wine vinegar and 1/8 cup of olive oil, plus a sprinkle of celery salt. From the antipasta bar at Whole Foods I grabbed marinated mushrooms (for me) and olives (for the hubs). A sliced up whole wheat baguette was the perfect vehicle for the cheddar, plus soaking up what was left of the red wine vinaigrette from. I added some fresh apricots to the cheese platter, mostly because I love how they smell and these were so fresh and played off the creamy and tangy cheese perfectly. Last but not least I grabbed two big cookies for dessert. While it was the easiest meal to put make it was delicious and the combination of salty, sweet, savory, and spicy made it satisfying and delicious. 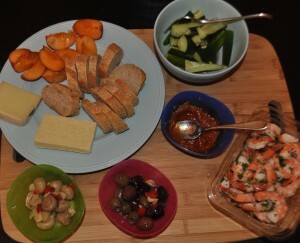 What would you serve in a snack dinner? I just started reading your blog. I L.O.V.E. I.T. Your breezy style, photos, and damn good food ideas are fantastic. 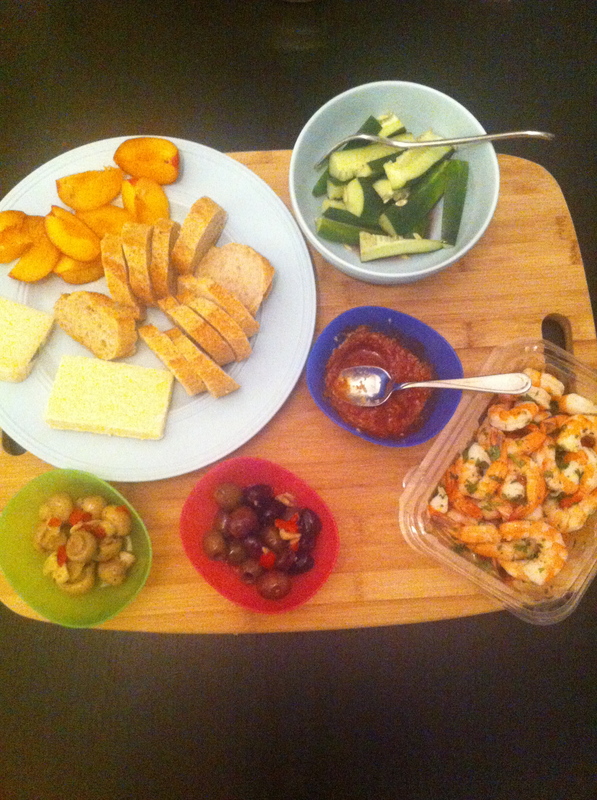 The Snack Dinner is my current fave . . . perfect for us mugs still in the throes of hot old summer (well, once I get back to Moab anyway). Have been thinking of you with all this fab food here in Paris. Wish you could join me for a market morning, lunch, painting viewing, and a French snack-n-stinky- cheese dinner! Love, love, love, your MIL.